LINCOLN – Today, Governor Pete Ricketts submitted written testimony opposing AM 1381 to LB 289, which proposes the largest tax increase in state history. The Revenue Committee has scheduled a hearing on the tax increase proposal for Wednesday, April 24, 2019. LINCOLN – Today, Governor Pete Ricketts issued a statement following news that the Appropriations Committee cut the Governor’s recommendation for property tax relief in half. The Committee voted to increase the Property Tax Credit Relief Fund by $26 million instead of the $51 million increase recommended by Governor Ricketts. LINCOLN – Today, Governor Pete Ricketts signed a proclamation declaring the week of April 22nd-26th as Community Development Week in the state of Nebraska. LINCOLN – This morning, Governor Ricketts saddled up with members of the University of Nebraska-Lincoln (UNL) Rodeo Association for a horseback ride outside of the Capitol to proclaim Rodeo Week in Nebraska. LINCOLN – Today, Governor Pete Ricketts joined representatives from the Nebraska District of Optimist International to celebrate their 100th anniversary. 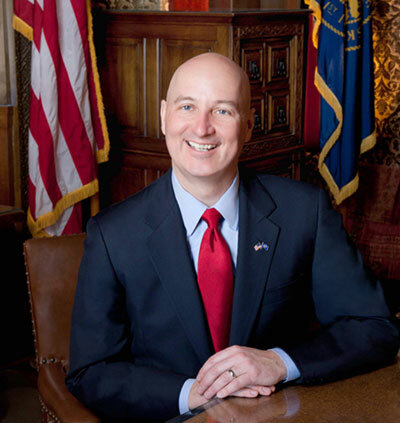 LINCOLN – Today, Governor Pete Ricketts issued the following statement in observance of the Easter holiday, which is celebrated on April 21, 2019. LINCOLN – Today, Governor Pete Ricketts and the Nebraska Department of Labor (NDOL) announced that the number of Nebraskans employed in March surpassed 1 million, a record high for the state. LINCOLN – Today, Governor Pete Ricketts joined the Sand County Foundation and the Alliance for the Future of Agriculture in Nebraska (AFAN) to announce the Sundstrom Family’s Broken Box Ranch as the recipient of the 2019 Nebraska Leopold Conservation Award®. The annual award honors Nebraska landowner achievement in voluntary stewardship and management of natural resources. LINCOLN – Today, Governor Pete Ricketts appointed Andrew C. Butler of Hastings to the District Court of the Ninth Judicial District. LINCOLN – Today, Governor Pete Ricketts appointed Joel B. Jay of Chappell to the County Court of the Eleventh Judicial District.